Urtica dioica - Natural Health - Lancaster and Preston . Urtica dioica is commonly known as stinging nettle and indeed it lives up to its name! Stinging nettle is a perennial plant which commonly grows in hedgerows, fields and wasteland. The leaves have serrated margins and are covered in tiny hairs which sting. Nettles flowers are greenish, hang in small clusters and appear between June and Sept. A member of the Urticaceae family. Eat as a cooked vegetable - they make a good spinach substitute. Always wear gloves when picking and pick in spring. Traditionally eaten as a spring tonic. Nettles are mildly diuretic, tonic, astringent, anti-haemorrhagic, anti-allergenic and alterative. 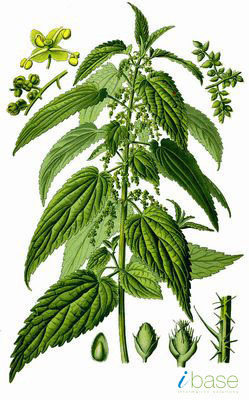 Nettle leaf is used in the treatment of hay fever, nettle rash, gout and arthritis. Nettles are rich in iron and therefore nettle tea is often prescribed by medical herbalists to treat iron deficiency anaemia. Nettle root can be used in the treatment of benign prostatic hypertrophy (BPH) and combines well with Serenoa repens. The root is harvested in autumn. Formic acid and histamine are major constituents. Pick nettles in spring or early summer when using both medicinally or culinary. Older leaves are high in calcium oxalate and therefore should be avoided. For obvious reasons ensure that you always use gloves when picking! 1 tsp of dried nettle leaf per cup of boiling water. Infuse for 5-10 mins and strain; drink 3 cups per day. 2 tsp fresh nettle leaf per cup of boiling water. Infuse for 5-10 mins (drinking the fresh plant is safe - boiling water breaks down the stinging hairs). Strain. Gently fry the onion in the butter for approximately 2 minutes. Add the potatoes and fry for a couple of minutes. Add the nettles and stock, bring to the boil then simmer for 15 minutes (or until the potatoes are cooked). Allow to cool then blend. Stir in the cream and add the nutmeg (optional) then season with salt and pepper. Gently reheat to serve.